Stress is a natural part of life, but when it becomes chronic, it can wear you down, both mentally and physically. If you have diabetes, stress can make it harder to control your blood glucose level. It also may increase the odds of developing certain complications, such as heart and blood vessel disease and infections made worse by a weakened immune system. In addition, it may distract you so much that you forget to take good care of yourself and to follow your self-care regimen. Yet here’s the catch: Diabetes itself can be a very stressful experience, as you’re forced to adjust to having a chronic disease and making all the lifestyle changes that go along with it. That’s why learning to manage stress is so important. To get a handle on stress, it helps to know a bit about the underlying physiology. The so-called fight-or-flight response is the body’s way of gearing up to fight or flee when it encounters danger. Heart rate, blood pressure, breathing rate, and muscle tension all increase — changes that would come in quite handy if you were being attacked or chased. Another hallmark of the stress response is the rapid mobilization of energy stores along with the inhibition of further storage. Glucose and the simplest forms of proteins and fats come pouring out of their storage sites to fuel whatever muscles might be needed immediately for fight or flight. At the same time, digestion is inhibited since there wouldn’t be time to derive benefits from this slower process. Most situations in modern life don’t involve much wrestling or running, however. Unfortunately, the body can’t distinguish between the threat of a predator in the wild and that of an overdraft notice from the bank, so it goes into the same state of high alert. Over time, a prolonged stress response may contribute to a range of health problems, including anxiety, depression, headaches, backaches, digestive difficulties, high blood pressure, and lower resistance to infection. As far as diabetes goes, many people say they see a link between stress and their blood glucose levels. In people with Type 2 diabetes, stress often raises blood glucose level. In people with Type 1 diabetes, the effects can vary. “Some people who have Type 1 diabetes say stress drives their blood glucose level up, while others say it drives the level down, and still others don’t notice any impact one way or the other,” says Mark Peyrot, PhD, a sociology professor at Loyola College in Baltimore who has researched the stress–glucose connection. “Within a given individual, though, the reaction to stress tends to be consistent.” In other words, if you’ve reacted to stress in the past with a spike in blood glucose, chances are you’ll react that way in the future, too. The means by which stress may affect diabetes is still unclear. However, part of the fight-or-flight response involves breaking down stored forms of glucose into blood glucose to ready the body for quick action. It’s easy to see how this could lead to high blood glucose in the short term. Stress also blocks the release of insulin in people whose bodies still make that hormone. In the long term, if stress becomes a frequent problem, a person might start to confuse its symptoms with other physical cues. This is why people aiming for tight diabetes control are often advised to record life events along with their blood glucose measurements and insulin or medicine doses. The goal is to identify patterns that make it easier to distinguish the effects of stress from other feelings, such as hunger and lightheadedness before a meal. In addition, stress may affect how people with diabetes take care of themselves. Some people react to stress by eating too much, drinking large amounts of alcohol, or vegging out rather than exercising. This behavior, in turn, may lead to unwanted fluctuations in blood glucose. Luckily, the body has a built-in mechanism for turning off the fight-or-flight response. Known as the relaxation response, it reverses the physiological changes brought on by stress. Heart rate, blood pressure, breathing rate, glucose mobilization, and muscle tension all decrease. While the stress response usually occurs involuntarily, people can learn to call up the relaxation response at will. 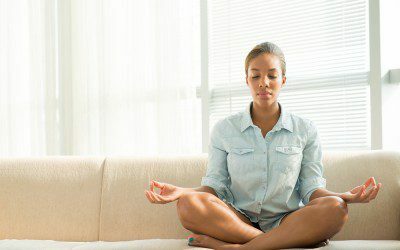 This is what relaxation techniques such as meditation and imagery exercises are intended to do. So learning such techniques should help improve diabetes control, right? Surprisingly, the answer to that question is a resounding maybe. “I think the jury is still out about the effectiveness of relaxation techniques for this purpose,” says James Lane, PhD, an associate research professor of psychiatry at Duke University. The results of published studies to date have been mixed, and many of these studies have been too small to draw definitive conclusions in any case. Lane thinks another explanation for the lackluster results may be the absence of a good selection process for those taking part in the studies. “You would expect that relaxation training would be more beneficial to people who report feeling anxious or who say their glucose control is related to stress,” he says. Yet most researchers have disregarded these issues when picking study participants. One study that backs up the view that relaxation may help some people more than others was led by Angele McGrady, PhD, a psychiatry professor at the Medical College of Ohio. Her small study included 18 people with Type 1 diabetes. Half were assigned to get relaxation training that involved the use of biofeedback, a form of therapy in which a person is taught to gain control of a physiological process with the aid of feedback from an instrument. In this case, people were hooked up to instruments that measured muscle tension and finger temperature. They then were taught to decrease the tension and increase the temperature, two signs of greater relaxation, by breathing deeply and listening to a relaxation tape. The other half of the participants got no such treatment. The researchers didn’t find any difference in blood glucose levels between the two groups overall. However, they did find that people with high scores on tests of stress, depression and anxiety were more likely to have smaller changes in blood glucose as a result of the relaxation training. The bottom line: Relaxation techniques may help with blood glucose control very little or a lot, depending on your psychological makeup and your body’s sensitivity to stress. Whatever the case, however, they probably won’t hurt, and they may leave you feeling less tense and more at peace. While you can certainly take a class in meditation or go to a therapist who teaches imagery exercises, you also can try such techniques on your own at home. McGrady offers this caveat, however: “If you have frequent, long-lasting feelings of anxiety or depression, you should seek professional help.” Based on her study, you may not be able to focus on your relaxation practice until you get these problems under better control. What’s more, while deep relaxation usually leads to feelings of enhanced well-being and calmness, occasionally it can bring up disturbing emotions, such as fears, sadness, or despair. Following are some simple techniques for getting the best of stress. You may find that one method is more effective or feels more natural than another. The best technique for you is the one that works. For more detailed instruction, see the books listed in “Relaxation Resources,” or ask your health-care provider to refer you to a good stress-reduction program in your area. 1. Sit or lie in a comfortable position, and close your eyes. 2. Place one hand on your belly just below your navel, and notice your breathing. 3. Feel your hand rise slightly with each breath in. Feel it fall with each breath out. 4. Focus on this rising and falling motion for several breaths. 1. Follow the steps above until you get a comfortable breathing rhythm going. 2. Now, say “ten” to yourself as you breathe in. Then breathe out. 3. With the next breath, say “nine” as you breathe in. Then breathe out. 2. Find a quiet place where you aren’t likely to be disturbed. 3. Sit or lie in a comfortable position, and close your eyes. 4. Try to relax your muscles, and start noticing your breathing. 5. Repeat your focus word or phrase to yourself as you breathe out. 6. Passively disregard any distracting thoughts that come up. 7. Continue for 10–20 minutes. Meditate once or twice every day, if possible. 1. Have an apple (or your favorite kind of fresh fruit) on hand. 2. Sit in a comfortable position. Relax with some deep, abdominal breathing. 3. Focus on what is happening in the here and now, and let go of other thoughts. 4. Now, focus your attention on the apple. Notice its appearance, feel and smell. 5. Then, take a bite, and notice the flavor as if you had never tasted an apple before. 6. Note without judging any other thoughts that may come up. Then passively return your mind to focus on the apple. 7. Enjoy the feelings that arise as you savor the experience of eating an apple. 1. Sit in a comfortable position. Relax with some deep, abdominal breathing. 2. Focus on the imaginary scenario: Imagine that your body is made of very strong, clear crystal. Notice how beautifully the facets shine in the light. Now, with each breath in, see your body fill with colored mist in a soothing shade. Watch as the mist flows slowly from your head, to your chest and abdomen, to your arms and legs, and finally to your hands and feet. As the mist gradually fills your body, you are imbued with peace and well-being. With each breath out, watch as the mist flows in the reverse order, from your hands and feet to your head. As the mist leaves your body, it carries away any stress and fatigue, leaving you feeling relaxed and rejuvenated. Stress can give you the intensity and energy to finish a project by a deadline, but chronic stress can affect your blood glucose control and your overall health. Even though life’s problems can blindside you every once in a while, using relaxation techniques can help you to roll with the punches and adjust rather than letting stress knock you for a loop. Linda Wasmer Andrews is a medical writer based in Albuquerque, New Mexico.